To the Glory of God and in grateful memory of the devotion even unto death of the young men of this Church and Sunday School, who gave their lives for truth, justice and freedom in the Great War 1914-1918. Their names are recorded hereon. 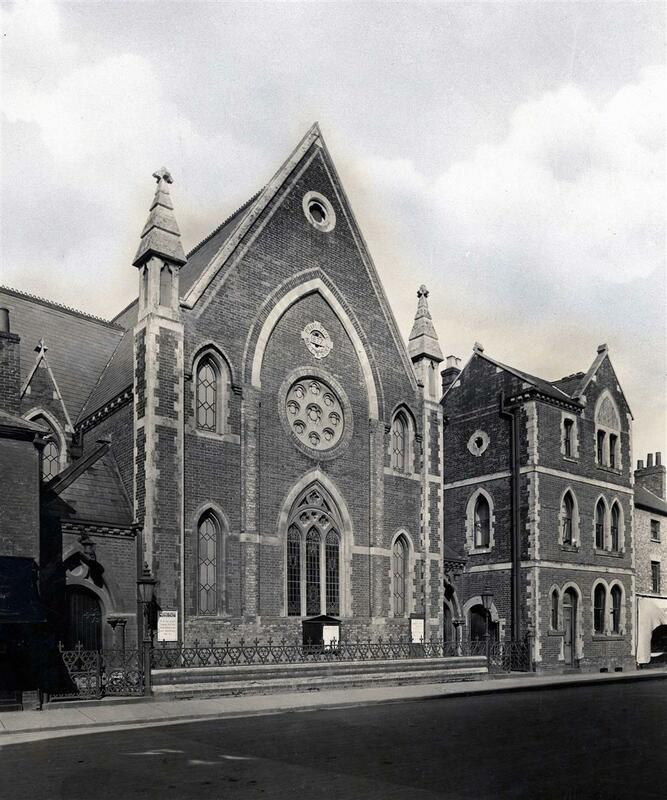 Newbury Primitive Methodist Church War Memorial – Dedication Service, 17 July 1921. The large congregation which filled the Primitive Methodist Church at the evening service on Sunday, remained for the unveiling of the war memorial window which followed. The ceremony was simple and sympathetic, with a sensity of feeling that was impressive. The Rev George Bennet, the preacher for the day, gave a stirring address, which touched all hearts, whilst the Rev J H Green unveiled the window. A laurel wreath was then laid upon the memorial this being followed by silent prayer. The hymns sung at the service were "For all the Saints," and "Lest we forget," whilst the organist, Mr Charles Griffin, as the congregation filed away rendered "Blest are the departed," from Spohr's "The last judgement." Under the whole of the memorial, under the glass, are inscribed the words: "To the Glory of God and in grateful memory of the devotion even unto death of the young men of this Church and Sunday School, who gave their lives for truth, justice and freedom in the Great War 1914-1918. Their names are recorded hereon." The window was designed and executed by Messrs Abbot and Co Ltd, Lancaster. After a dedicatory prayer had been pronounced by the Rev A Barret Gowers, the Rev George Bennett said they did well to linger for a while to pay homage to the memory of the Glorious Dead. It was well that they should keep within the precincts of their Church an memorial to remind them in days to come of those who went out from them to the War, some of whom never returned. The form that the memorial took was unimportant so long as they had some fitting symbol that would remind them of those brave and gallant men who fave themselves freely for their country. When little children grew up and asked was the window meant, they would be able to tell them of these young fellows, gifted, noble, true, nubered among the bravest of the brave, who sacrficed their lives, and whose names the memorial commemorated. These men were thier debtors. But for that spontaneous uprising, those attending that service might now have been under the heel of a vile, tyrannous oppressor. The national loss was great, but the sorrow and the value of the lives that were sacrificed could not be computed, lives of beautiful boys, many of them sleeping in nameless graves, but where they slept was a piece of land for ever England. Many people remembered those brave men in the days of the war, how they went tripping along singing merrily and not reluctantly, for the spirit of patriotism had seized them; how they sang that familiar song, "It's a long, long way to Tipperary," but to millions it turned out to be longer than they thought. To-day they slept, and the national loss was imcoputable, for a whole generation of the best manhood of the land had beens swept away during those days of carnage and bitter strife. And what had occurred since the war? Surely that which was unworthy of England and enough to break her pride. The war gained wealth which flowed into unmerited thousands of pockets, and this had been squnadered before their eyes, whist ex-soldiers who had risked their all returned to the verge of poverty and starvation. But there was no equality of sacrifice, and they wanted to remember their dead, those who left their locality, their church, congregation, and their Sunday School to brave the conflict. Why should their names be commemorated? Because the flippant part of the nation - a large part indeed - were sowing seends of evil human sins which brought war in their train, and led to disaster. Keep alive the memory of the dead for they wanted no more memorials! Militarism must never again get the upper hand. The old adage "if we want peace, we must be ready for war," must no be believed. It was untrue, England's greatest justification was that the war found her unprepared for war. She did not want war. If the people believed in might, they would soon begin to talk about regrettable necessities, for the sake of some hypothetical craving, becoming imbued with the conception that it was necessary to do wrong. Now that the war had beenw on, they had to win the peace, for the strife was prolonged in their midst, even since the Armistice had been signed. Religion must govern politics if there was to be abiding peace and concord at home and abroad. The basis of Christian duty was to forvive one's enemies, not to be vindictive, as some of the argumants and attitudes of powers had been. The spirit of forgiveness would help more than anything else to put the world right, and only by its adoption would those countries at present outside the League of Nations be induced to come within. The Church also had its part to play. And what of the mothers of the land? If they were asked to decide whether there should be war or not, what would they say? They would say that they would not go through the agony of bearing and rearing boys, and sacrificing their maternal love to provide them for slaughter on the field of battle. Motherhood would revolt, and worth would be their reason for so doing. But let all pray that the things for which their brave sons faought, honour, liberty and right should prevail unhindered by militarism and its evils. When their eyes ran down the lost of names on the memorial window, let them think of those gallant men, and may the memory stir them on to attain those ideals for which they died. To those who had lost loved ones, it would revive sadness and sorrow, but let them find comfort in the thought and the words, "They died for us." Following a hymn, the Rev J H Green unveiled the window, and a wreath of laurels was places upon it. The service concluded with the Benediction being pronounced by the Rev Percy Jackson. A tablet has also been placed in the Church to the memory of Lieut Hedley Griffin by members of his family.